Season’s greetings. The blog has been inactive for a while, but we still exist floating somewhere out in the blogosphere, and we want to say hello and best wishes for a lovely solstice or holiday of your choice, and happiest of New Years to all who wander here! 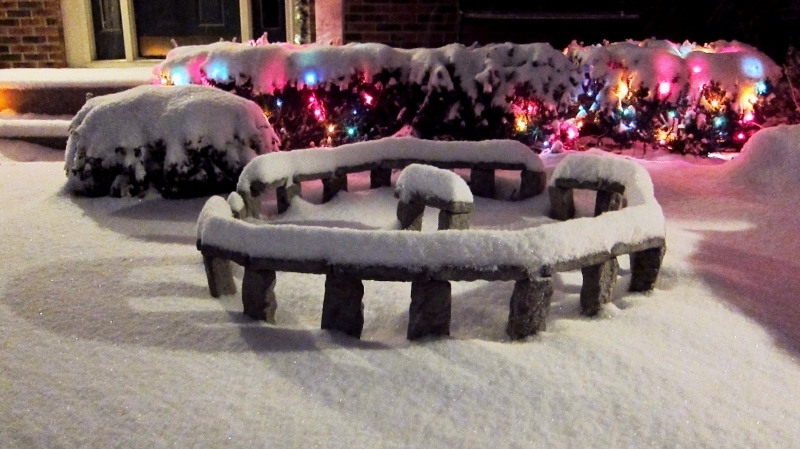 We have featured this garden Stonehenge replica once or twice before on Clonehenge, but we recently received this photo in an email from lovely Friend of the Blog Jill Warvel and it was too good to pass up! Thank you, Jill and thank you to all of our lovely readers. Enjoy the rest of December and all of 2011. And think of us when you here of, create, or wake up naked next to a Stonehenge replica. Pictures are always welcome–of the replica we mean, of course! Remember, you don’t have to be at Stonehenge to notice the path of the rays of the rising solstice sun. Mark your desk, mark your wall, mark your garden or trees. Honour the play of the sun with the land! Something real that enters all our virtual lives.